This topic describes how to build a Native Client project in the Tizen Studio. A Native Client (NaCl) project can be built using the "Debug-glibc", "Debug-pnacl", "Release-glibc" or "Release-pnacl" configurations. Depending on the selected build configuration, binaries are created for either one or several architectures, with or without debug symbols. Define the NaCl toolchain to use for building the project. 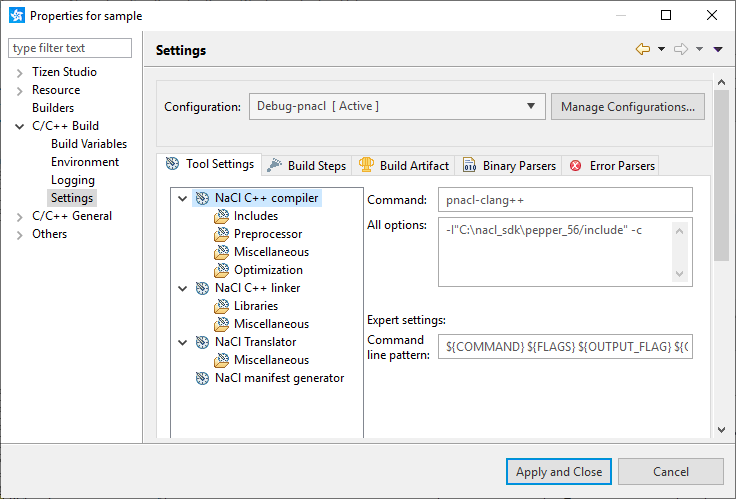 In the "Project Explorer" view, right-click the project and select "Properties > Tizen Studio > NaCl toolchain". Select a valid NaCl toolchain from the list. Valid toolchains have the "ready to use" or "update available" status message. In the "Project Explorer" view, right-click the project, select "Build Configurations > Set Active", and select the configuration you want. The "Debug-pnacl" configuration is active by default. In the "Project Explorer" view, right-click the project and select "Build project". In the "Console" view, you can monitor the build progress and status. The build result is located in the "CurrentBin" directory inside the main project directory. The directory is actually a symbolic link to the build directory for the current build configuration ("Debug-glibc", "Debug-pnacl", "Release-glibc", or "Release-pnacl"). On systems where symbolic links are not supported, the "CurrentBin" directory is a copy of the build directory. 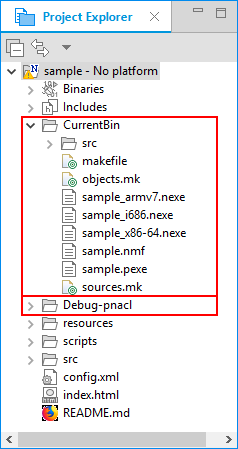 If you selected the "Debug-pnacl" or "Release-pnacl" configurations, the ".pexe" file contains the PNaCl (Portable NaCl) executable code built from the C or C++ source code, independent of the target architecture. The ".nexe" files contain the native NaCl executable code for the target architecture or architectures. If you selected the "Debug-pnacl" or "Release-pnacl" configurations, the binaries are translated from the ".pexe" file, otherwise they are direct results of the linking process. If you selected the "Debug-glibc" or "Release-glibc" configurations, the required library files are produced. The manifest file contains paths to the ".nexe" files for the supported architectures. The Web browser uses the manifest file to find the appropriate ".nexe" file. In Tizen applications, the manifest file also contains a list of application permissions needed to load the NaCl module. The ".pexe" file is not listed in the manifest file, since it is only supported by the Google Chrome™ browser. 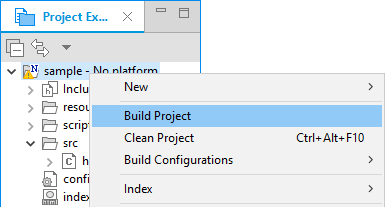 In the "Project Explorer" view, right-click the project and select "Properties > C/C++ Build > Settings". From the "Configuration" drop-down menu, select the configuration that you want to modify. For each tool, you can change the command name and its options. Change the settings with caution, as they can cause the build system to break. "Includes" specifies the include paths to be passed to the compiler command. "Preprocessor" specifies the defined and undefined preprocessor symbols. "Miscellaneous" specifies other command parameters to be passed to the compiler. "Optimization" defines the optimization level. "Libraries" specifies the library search paths and library names to be passed to the linker command. "Miscellaneous" specifies other command parameters to be passed to the linker. "Architecture" defines the architecture to generate the ".nexe" file for. This setting is only available in the "Release-pnacl" configuration. "Miscellaneous" specifies other command parameters to be passed to the translator. NaCl Manifest Generator specifies the manifest file generation command. To save the settings, click "OK".